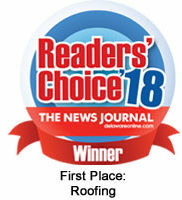 Voted Delaware’s #1 Gutter Repair & Gutter Cleaning Company 7 Years in A Row! 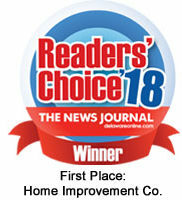 Voted the #1 gutter company in Delaware, we are experts in gutter and downspout repairs and cleaning. Whether you’ve got fallen gutters from storm damage or can’t stop your gutter and downspout leak, we are the top local gutter repair company you’ve been searching for! Looking for a great gutter repair deal? No need for promo codes or coupons here! Just call 302-998-4500 today and mention our $199 FIX IT Repair Special for your gutters. We will fix your small gutter repair or clean up to 100 linear feet of gutters for just $199. *Must mention special at time of scheduling. Offer limited to materials stocked on truck. Offer not valid for existing contracts. Quality Gutter Repairs & Gutter Cleaning Done Right the First Time. Fast! Voted the Wilmington News Journal’s Readers’ Choice Winner for Best Home Improvement Company, we specialize in fast gutter repair or gutter cleaning for customers in the Wilmington, Delaware area and surrounding areas as well. Our professional, local gutter service company team can clean and repair gutters and downspouts in Delaware, eastern MD, southeastern PA, and southern NJ. Expert Gutter Contractors You Can Trust. For Life. Our dedicated gutter repair service department is licensed & insured to find and fix your broken gutters and downspouts. Not sure if you should repair or replace your hanging gutters? Our expert staff is not only trained on how to properly repair all gutter types, but they are also trained to give you an honest answer to form a lasting relationship with every customer, every time. We don’t want your business for now…we want your business for life. Want a local gutter service company you can trust? Call 302-998-4500 today and try out our $199 FIX IT Gutter Repair or Cleaning Special! Do you have dirty or clogged gutters? Our $199 FIX IT Gutter Cleaning Special will clean up to 100 linear feet of your gutters and get them back in action again. Want a longer lasting solution? Ask our gutter cleaning expert about our industry-best gutter guards/gutter covers options that might be the answer for your constantly clogged gutters. Our staff is eager to help and to show you the options if you’re interested. No pressure, just information, as we always believe in providing to our customers.